Sturdy, stylish aluminum trailer wheel is lightweight, provides superior corrosion protection and meets Department of Transportation standards. Lowest Prices for the best tires and wheels from HWT. 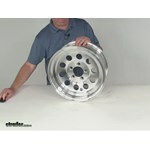 Aluminum HWT Hi-Spec Series 03 Mod Trailer Wheel - 15" x 6" Rim - 5 on 4-1/2 part number AM22627 can be ordered online at etrailer.com or call 800-298-8924 for expert service. 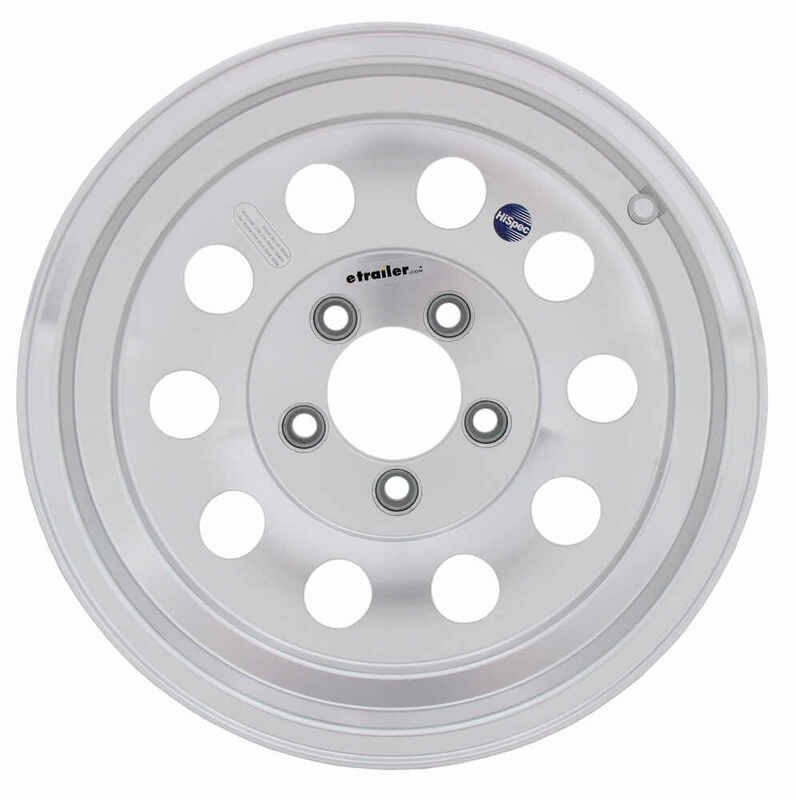 22627 HWT Hi-Spec Series 03 Aluminum Mod Wheel - 15"
Today we're going to review part number AM22627. This is the HWT 15" by 6" High-Spec Series 03 Silver Modular Aluminum Trailer Wheel with the 5" on 4 and 1/2" Bolt Pattern. 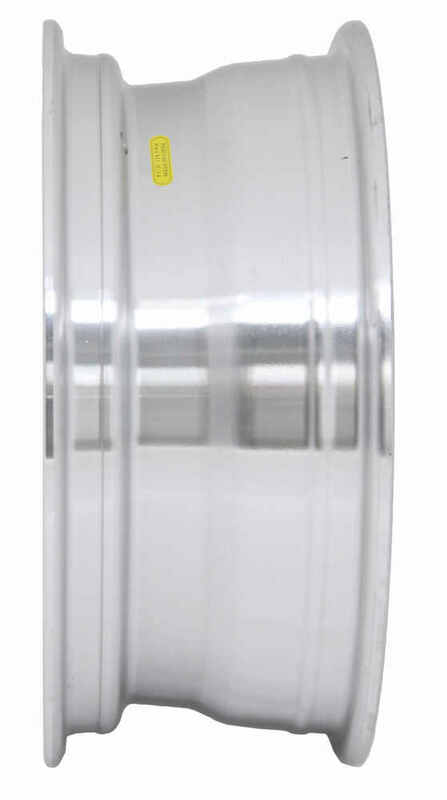 Now this wheel is a durable, corrosion resistant aluminum construction. It's very lightweight. The design on this is a very HI-Spec series 03 modular design. When they say modular design, it has the round holes all the way around. It has the silver accents. It's a very attractive wheel. If you notice the face of the wheel and the lip is all a machine polished finish that gives a shine to it. Then they clear coat the front and even the back of the wheel to protect that finish. Now this wheel does use the ICF technology which is improved clamp force. That's designed to help keep the wheel securely in place so there's no need to re-torque it after your initial installation. This is a high quality wheel. Meets the Department of Transportation's specifications. A few specs on this starting with the diameter of the wheel. Now the diameter's always measured inside to inside. It's 15". We're going to take a tape measure and we're going to put it right on there. You can see 15" for the diameter. The width is the same way, inside to inside or bead seat to bead seat. As you can see, 6" so 15" by 6". The bolt pattern on this wheel is a 5" on 4 and 1/2" bolt pattern. Now if you go to measure the bolt pattern on a wheel like this that's an odd number of lugs, what you'll need to do is pick one of the holes like this one and then you'll measure from the center of that hole directly across to either one of these holes, but you'll measure to the outer edge. Center of the starting hole to the outer edge. Let's do this one to this one and that'll give you an idea of the bolt pattern. We'll take our tape measure and go center to outer edge and you can see is right at 4 and 1/2". 5" on 4 and 1/2" bolt pattern. This wheel does use the wheel lug size of a 1/2" by 20". The pilot hole diameter which is the large hole here in the center of the wheel goes over the hub of your trailer. The diameter of that opening is going to be right at 3.19 inches and the weight capacity on this wheel is 2,150 pounds. That should do it for the review on part number AM22627. 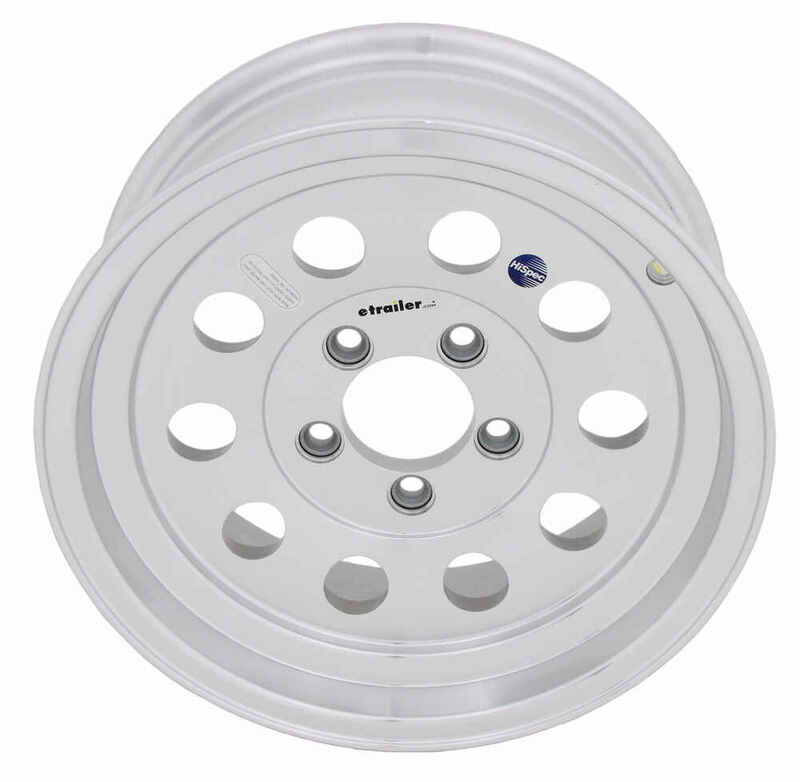 This is the HWT 15" by 6" Hi-Spec Series 03, Silver Modular Aluminum Trailer Wheel with the 5" on 4" and 1/2" Bolt Pattern. Order: RelevanceNewestRating - High to LowRating - Low to High Sturdy, stylish aluminum trailer wheel is lightweight, provides superior corrosion protection and meets Department of Transportation standards. Have used these alloy wheels with great success.The finish still looks as it came out of the box. Have put approximately 6,000 miles on the wheels and new Michelin with any problems. They are a great product and value! The Aluminum HWT Hi-Spec Series 03 Mod Trailer Wheel # AM22627 that you referenced has a zero offset and a backspacing of 3-1/2 inches. The Aluminum Hi-Spec Series 03 Mod Trailer Wheel # AM22627 that you referenced actually does take a lug nut with a 60 degree cone like the majority of the wheels on our site. Since the wheel bolt size that fits this wheel is 1/2" - 20 I recommend using the Chrome Trailer Wheel Lug Nut # 12CLN and then the Wheel Lock Set # RG01-150. 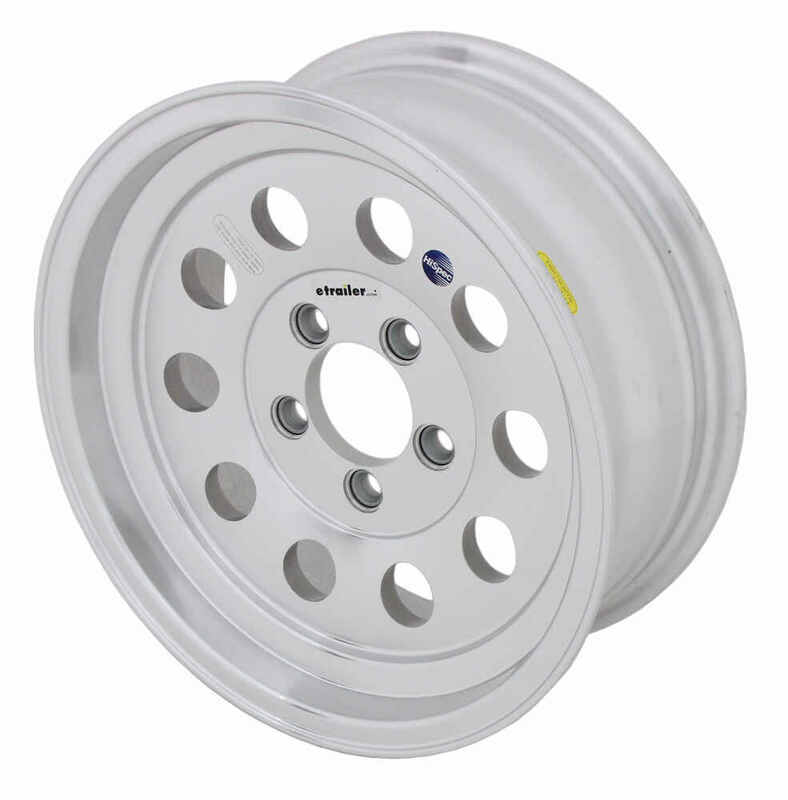 As long as the 3,500 lb axle had a 5 on 4-1/2 inch bolt pattern the Americana Aluminum Mod Trailer Wheel # AM22627 that you referenced would be a great choice as it has 2,150 lbs at 65 psi capacity per wheel. If you are unsure of what bolt pattern you have check out the link I attached that details how to determine this. 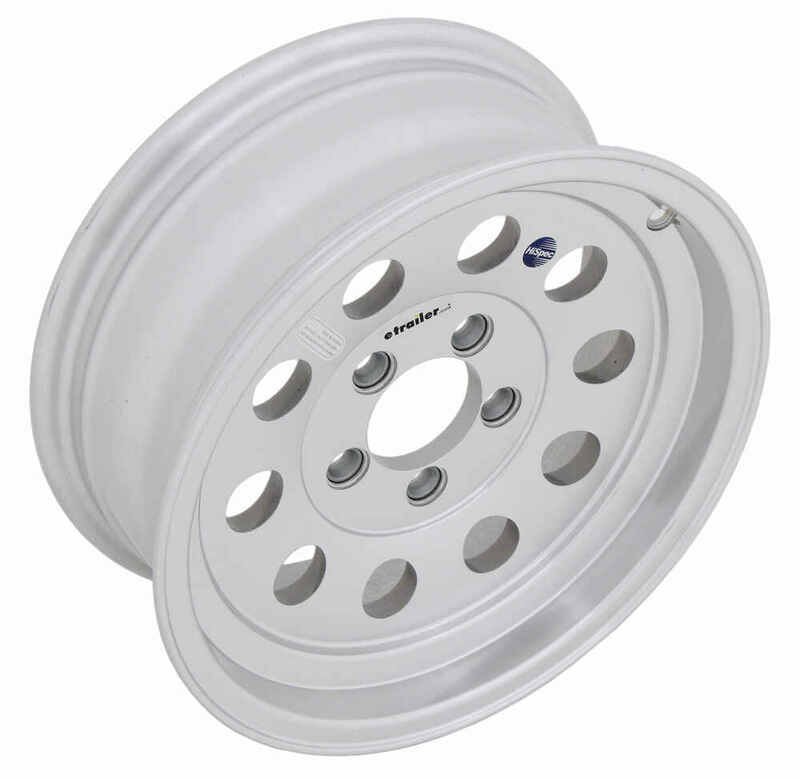 Yes, we have aluminum wheel # AM22627 which is 15 x 6 inches with a 5 on 4-1/2 bolt pattern. I have included a link to a video review of this wheel for you.